Looking at a work of art on paper, it can be difficult to imagine the close relationship between a print, and metal craft. Yet printmaking owes much of its legacy to metal arts and this affiliation was more apparent in early western prints as many of the masters learned their art from the metal smiths, such as Albrecht Dürer who was the son of a goldsmith and was familiar with that art. In the 15th century and early 16th century many experiments and innovations in printmaking took place in the design of metal (from which printed impressions are taken). Some of these early techniques were short-lived and are now unfamiliar to 21st century audiences. One such technique thought to have developed in Italy is nielli printing which was practiced up to the 16th century. 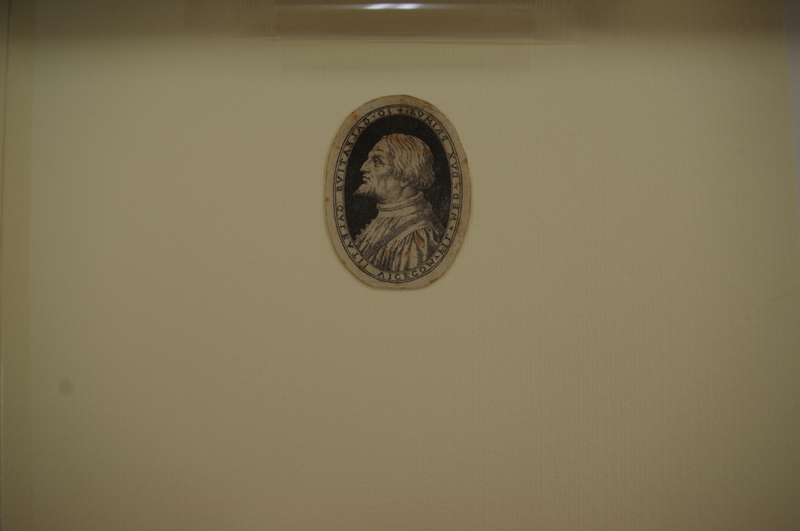 This is technique utilises an engraved decorative design on silver in which lines are filled with ‘niello,’ a black chemical substance, which contrasts with the silver. Before niello is applied to the metalwork, the lines are filled with ink and an impression taken, and this is a neilli print. Rare examples of niello objects and their impressions are held in the British Museum. The Baillieu Library Print Collection has acquired its first example of a neilli print and like most of these impressions it is tiny work measuring only 4.2 centimetres diameter. The portrait depicts Gian Galeazzo Visconti (1351-1402) who became the first Duke of Milan. While the artist of this nielli print is uncertain, the portrait was adapted from an effigy that adorned the monastery Certosa di Pavia. 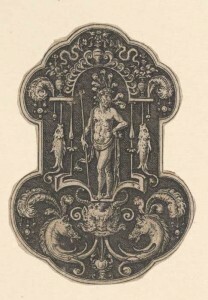 Another version of this effigy was engraved by Agostino Carracci for the book Cremona fedelissima città, et nobilissima colonia de Romani published in 1585. Another substantial example of metal craft held in the Baillieu Library is the Wilson Hall presentation set organised by the Walsh Brothers. The set comprising trowel, mallet, mortar board and their box was given to Sir Samuel Wilson on 2 October 1879 by Sir Redmond Barry, on behalf of the Council of The University for use during the ceremonial laying of the memorial stone for Wilson Hall. 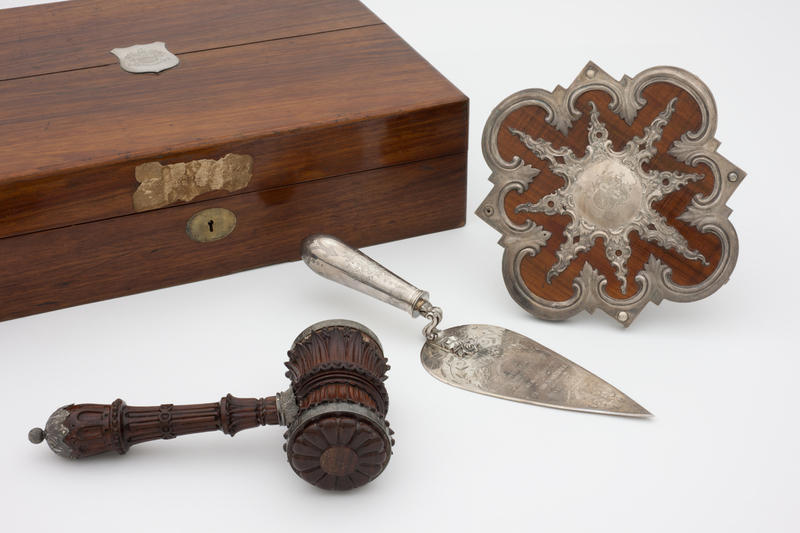 If the ornate silver trowel from this set were to be inked, it is easier to imagine its decorative design appearing in reverse on a sheet of paper, just as nielli prints were made directly from metal objects. 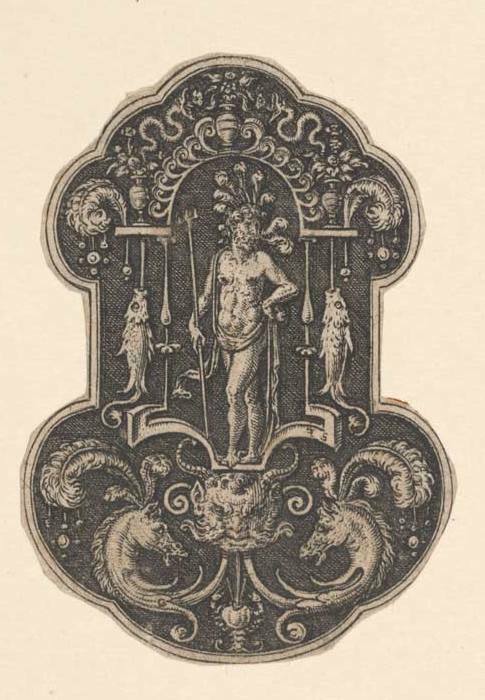 Other examples from the Print Collection displaying the relationship between metal work and prints include designs for medallions and ornamental decorations.